The number one thing to not do when writing an NCAA tournament resume is have extended losing streaks. Beyond the optics, a string of L's will generally include several games that are deemed "bad" when the tournament-bid debate gets interesting. 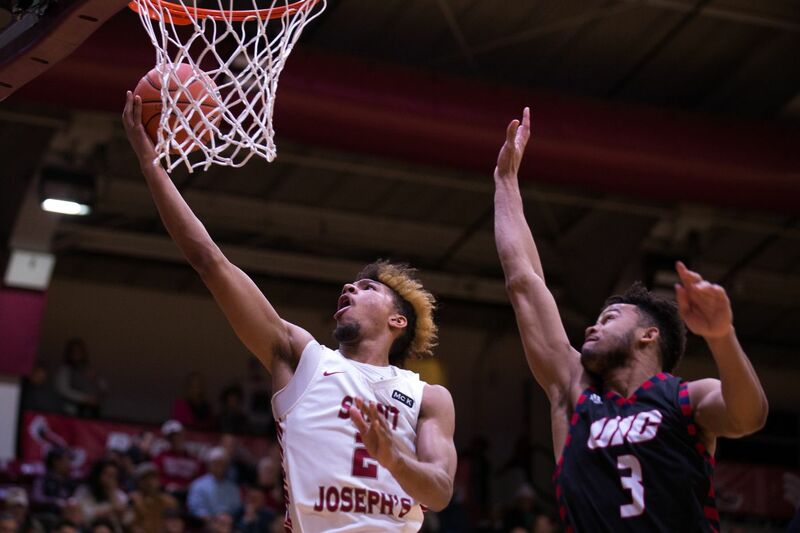 St. Joseph's started the season 3-0, including a good win on a neutral court against Wake Forest of the Atlantic Coast Conference. Then, the Hawks dropped three straight, including one of those bad losses at William & Mary of the Colonial Athletic Association. Given the circumstances, the Hawks should have had a sense of urgency Wednesday, in returning to Hagan Arena for the first time in two weeks against the University of Illinois at Chicago. It took nearly 25 minutes and a 13-point deficit, but the Hawks finally regained the form they had not demonstrated since beating Wake in Myrtle Beach, S.C., nearly two weeks ago. Redshirt junior Fresh Kimble had 12 of his career-high-tying 31 points during an 18-2 run to give St. Joe's a lead, and the Hawks kept flying to an 89-75 victory. Atlantic 10 scoring leader Charlie Brown Jr. added 19 points, and freshman guard Jared Bynum scored 17, as St. Joe's (4-3) got back in the win column. Kimble scored 31 in a loss to West Virginia on Nov. 18, and his performance against UIC marked the third straight game that the Hawks have had a 30-point scorer. It wasn't the first half that St. Joe's was looking for, but Hawks coach Phil Martelli said he saw a harbinger in Tuesday's bad practice. "I'm looking at them and thinking, 'How can you all be so sad,' " he said. "You're playing basketball. "It was like looking out there and saying, 'Your dog got run over,' and, 'Your dog got run over,' and, 'Your dog got run over.' That's an amazing fact. All of your dogs got run over, because that's the only reason you can be sad." UIC (3-4) took advantage of the Hawk's lack of inspiration and led, 40-32 at the half. The Flames pushed the advantage to 55-42 with 15:39 left. Then, the Hawks got a three-pointer from Taylor Funk, and captain Kimble figured out how to lead. "It was time to pick up my aggressiveness and energy," Kimble said. "It just happened to be on the scoring end for our team tonight. "I felt like I had to lead somehow. We started out sluggish. I think we were feeling a little sorry for ourselves because of the losing streak we were having. "We were able to pick it up with a big second half, and now the spirits are uplifted."